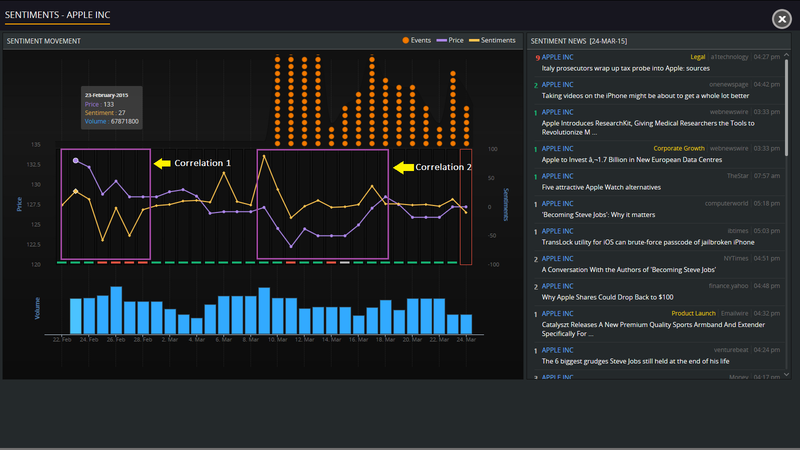 Heckyl’s sentiment tool allows a user to measure the sentiment of a particular news item or news flow around an instrument and evaluate its potential impact, in real-time. In today’s blog let us take a look at Heckyl’s Stock Sentiment graph and how effectively one can use it as a precursor to stock price movement. Apple, world’s most valuable listed company has huge traction globally as one of the most renowned brands amongst consumers, mainstream and social media. Let us take a case study of Apple’s price movement compared to its sentiment graph. As we can see from the chart in first instance (correlation 1) between February 23 and 27 sentiment score moved lower from 13 to -50 and stock price drifted lower from USD 132 to 128. On February 25, news broke that Apple will have to pay USD 530 million for patent infringement. News of Apple may face more lawsuit for patent infringement hit mainstream media on February 27 dragging the stock lower to USD 128. In instance 2, between March 9 and 11 sentiment score moved down from 88 to -19 and stock price slumped from USD 127 to 122. On March 11, news broke on mainstream media of Apple Store and iTunes facing outage for more than 8 hours. However, it was a temporary phenomenon and stock rebounded back to USD 127 on March 17 after positive news on Apple Watch, Apple TV and new investments. As seen from the above correlations, sentiment score moves ahead of the price movement guiding an investor or trader to predict the future stock price movements before market opening. 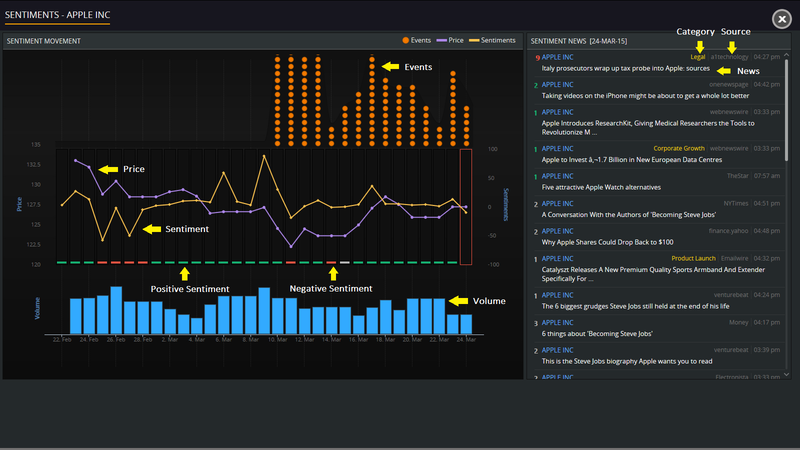 Heckyl’s Sentiment graph allows a layman to understand how a stock will get impacted by forming a cluster of news of similar topics and analyzing the overall positive or negative sentiment for each news cluster while institutional players can keep an eye on all relevant news and no major news gets missed out. Live streaming of news as real-time pulse and sending appropriate alerts to users is one of the salient features of Heckyl’s News platform. A user can also view latest news and historical news up to 2 weeks. Apart from stocks, one would get live news, alerts and notifications on commodities, currencies, geo-political news from 35 countries. Stay tuned to this page for more blogs on new and exciting features of our products.